Magma Marine Kettle Gas Grills are perfect for boaters who want the great taste of BBQ while they enjoy the water. Magma also makes tailgate sized grills that are perfect for camping or table top use. 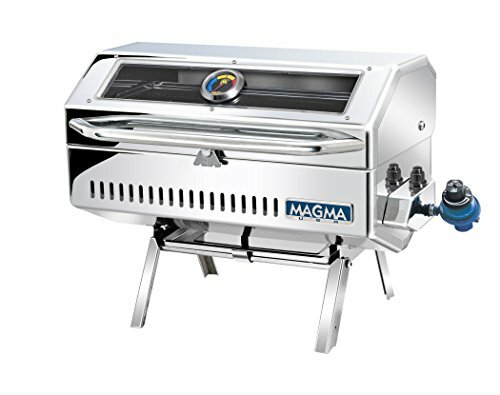 Clicking on the links below will open a detailed description of the Magma grill for sale in a new window on eBay. Magma's completely redesigned Newport 2 Infrared Gourmet Series Gas Grill; a perfect addition for that perfect day on the water. This finely crafted grill is perfect for grilling burgers, steaks, chicken breasts, or fish. New features include: rounded edges for an elegant look, a dynamic combustion system which keeps the grill lit in even heavy winds, a dependable electronic ignition system, and a tempered glass viewing window. "Anti-Flare" infrared technology produces intense, evenly distributed heat, reducing flare-ups and immediately emulsifies drippings giving your meal a great Smokey flavor. Made in the U.S.A. and constructed entirely of 18-9 mirror polished stainless steel to withstand even the harshest environments. 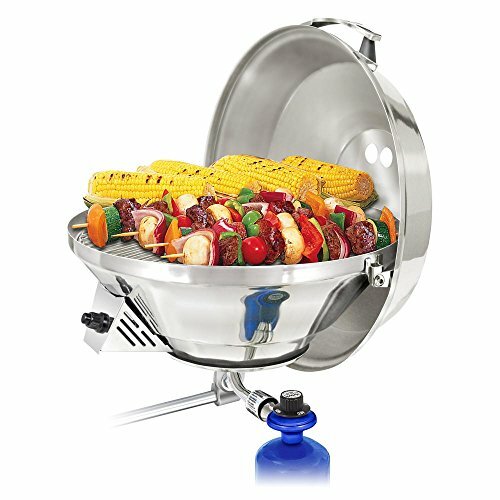 Equipped with fold-away table top legs for go anywhere use; while the hermetically sealed thermometer let's you control the grill's heat level. The swiveling control valve/regulator, designed to use 1 lb. propane fuel canisters, allows for quick, safe canister exchanges or easily adapt grill to existing on-board low pressure propane (LPG) or natural gas (CNG) fuel systems. Magma mounts, serving shelf, and fuel canisters sold separately. Your grilling experience will be greatly enhanced with Magma's completely redesigned Catalina 2 Classic Gourmet Series Gas Grill. 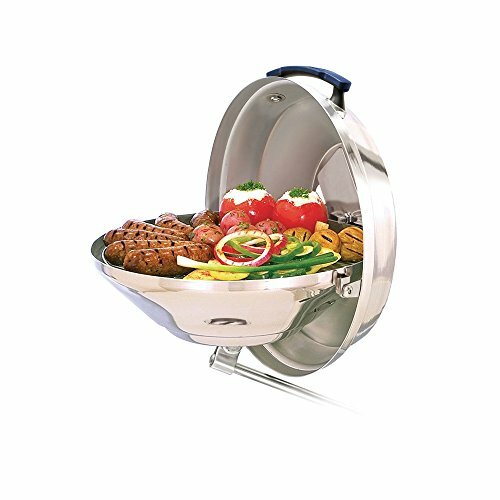 This versatile, portable, and finely crafted grill is a perfect addition for feeding that large crew. New features include: rounded edges for an elegant look, a dynamic combustion system which keeps the grill lit in even heavy winds, and a dependable electronic ignition system. Made in the U.S.A. and constructed entirely of 18-9 mirror polished stainless steel to withstand even the harshest environments. The primary and secondary grilling surface, gives you the option of searing, slow cooking, or warming. Equipped with fold-away table top legs for go anywhere use, and a hermetically sealed thermometer. The swiveling control valve/regulator, designed to use 1lb. disposable propane fuel canisters, allows for quick, safe fuel canister exchanges or easily adapt grill to existing on-board low pressure propane (LPG) or natural gas (CNG) fuel systems. "Heavy Duty" mounting hardware is recommended. Magma mounts, serving shelf, and fuel canisters sold separately. The Weber Q series gas grills feature a modern stylized design, even cooking, and a compact size. The Weber Q100, Q120 Grill, Q200 Grill, and Weber Q220 are compact models perfect for tabletop or tailgate grilling. 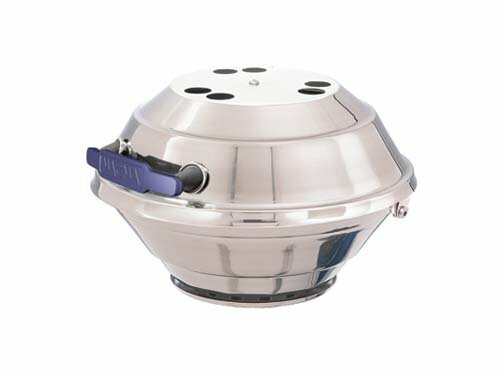 These models are designed to use a smaller 14.1 ounce or 16.1 ounce disposable liquid propane tank, and can use a 20 pound LP tank with an optional adapter. Clicking on the links below will open a detailed description of the Weber Q grill for sale in a new window on eBay. Table top gas grills are great for apartment dwellers and picnic goers. These small gas grills are easy to just about anywhere you want to go. 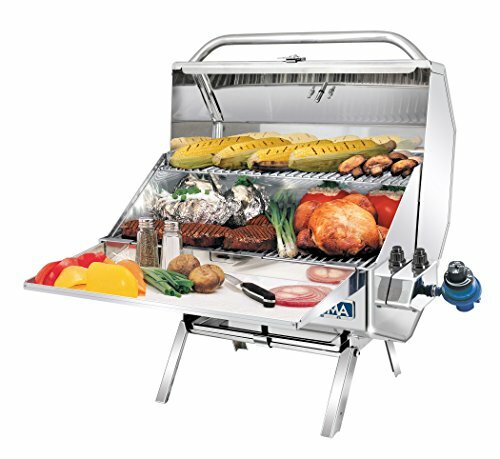 Get a high quality stainless steel table top grill at below retail prices. Clicking on the links below will open a detailed description of the small table top grill for sale in a new window on eBay.